Heat the oil in a large frying pan and fry the onion and cubed pepper until soft. Add the beans, well drained, and fry for about 3 to 5 minutes. Add some of the broth from cooking the beans if the mix is getting too dry. Incorporate the rice and continue frying about 3 minutes more adding more of the broth to keep the mixture from getting too dry. Finally, garnish the gallo pinto with the chopped coriander. In Nicaragua, gallo pinto is more hash-like in terms of texture. Neither the broth from cooking the beans, the peppers nor the cilantro is added. You can also use brown rice, although it’s not traditionally used. You should try using this gallo pinto as an empanada filling. Among the many different combinations of rice and beans that exist, the ones that come to mind are: gallo pinto, the national dish of both Nicaragua and Costa Rica (although it’s not exactly the same in both countries), casamiento in El Salvador, tacu tacu in Peru, calentado in Colombia, moros y cristianos in Cuba, etc. This shows that the combination of these two simple ingredients is a gastronomical success in many countries where they are frequently eaten. 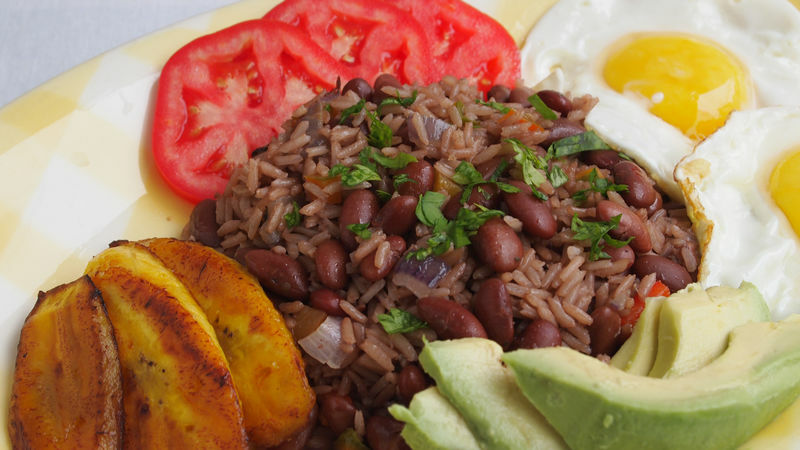 Among the traditional meals of Costa Rica, gallo pinto is a dish not to be missed, since it’s served for both breakfast and dinner, as the main dish accompanied with varied garnishes, or as the garnish itself. They say the combination of rice and beans makes up a complete vegetable protein, so you know from the get-go that you’re feeding your family well with this delicious, comforting and super simple dish. It’s so easy to make that there shouldn’t even be a recipe to walk you through. Just use beans and rice cooked the day before. In Costa Rica green peppers and coriander are added, along with Lizano sauce, famous in local gastronomy. In the event that you can’t find it, you can substitute Lizano sauce with Worcestershire sauce. If you have the basic ingredients on hand, the process won’t take you more than 20 minutes. Accompany this gallo pinto with fried, ripe plantains or plantain chips, fried (sunny-side up) or scrambled eggs, cream or cheese, and of course, always with corn tortillas. What will you serve with your gallo pinto.